This is a fabulous looking vintage 38mm. 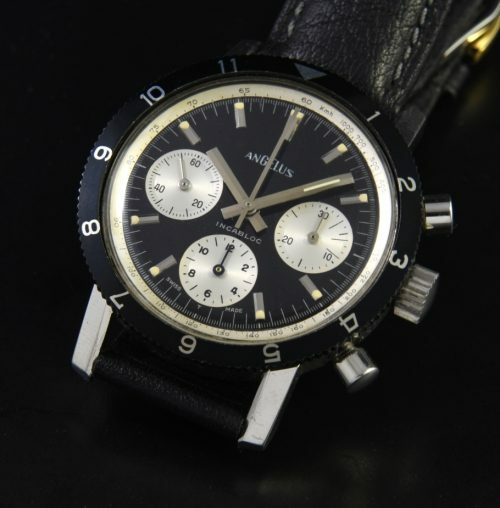 1960’s ANGELUS having the famed and fine Valjoux 72 manual winding chronograph movement. When we purchased this watch, it was missing the bezel and we replaced it with this black turning bezel having silver Arabic print. The dial of this watch is completely original. The case and movement are both unsigned, leading me to believe that possibly this watch was assembled. Either way, this amazing contrasting dial and fine (just cleaned) and accurate Valjoux 72 movement make this a very attractive watch to wear for many years to come. Valjoux 72 watches of ANY brand are highly sought after.